In The Sheds - Trusted with classics by Logan, Bailey, Lane, Couldrey, Landis, Sparkman and Stephens, Herreshoff, Palin, Lidgard, Townson, Young and other designers. Slow progressing restoration of this Logan work boat. Now in our shed drying out after a few years of neglect. A 1969 built Riva Superaquarama. She is undergoing a total strip down and restoration. 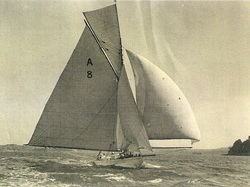 She was built in Sarnico, then delivered to a Mr Tachini in Monaco, then bought by an American and kept on Lake Tahoe. Later bought by Atle Staff in Norway and kept at his summer house on a fjord, and in 2005 was bought by the current owner who had her in Hong Kong till 2011.